This post contains affiliate links to products & resources that you’ll hopefully find helpful! This shop has been compensated by Collective Bias, Inc. and its advertiser. All opinions are mine alone. 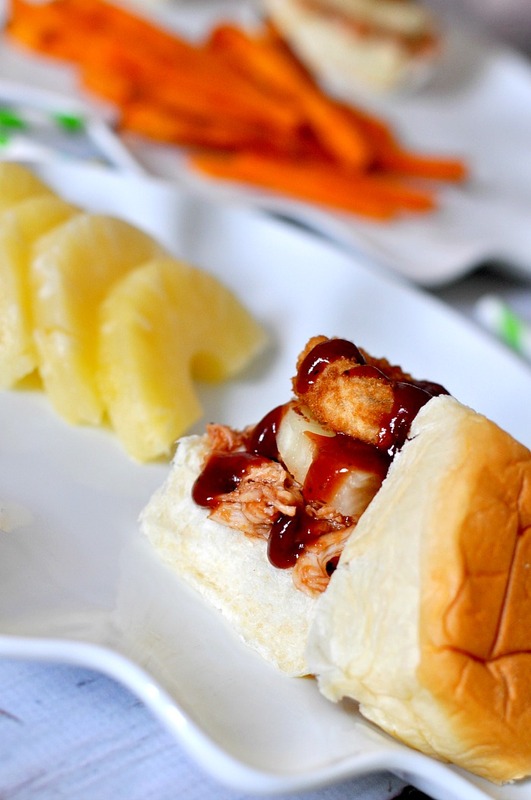 THESE CRISPY ONION BBQ CHICKEN SLIDERS MAKE AN EASY DINNER AND A FUN GAME DAY APPETIZER! With the weather finally starting to take a turn toward spring, it’s time for some fresh new recipes! We always seem to be busier this time of year. Between the combination of having light longer and gorgeous weather, everything seems to come to life. We all just want to be out enjoying spring after a long winter! So part of what I look for in spring recipes is EASY! I love being able to toss something into the crock pot so that food is for the most part ready whenever we decide to come back inside. Having good leftovers after is also a bonus for us! 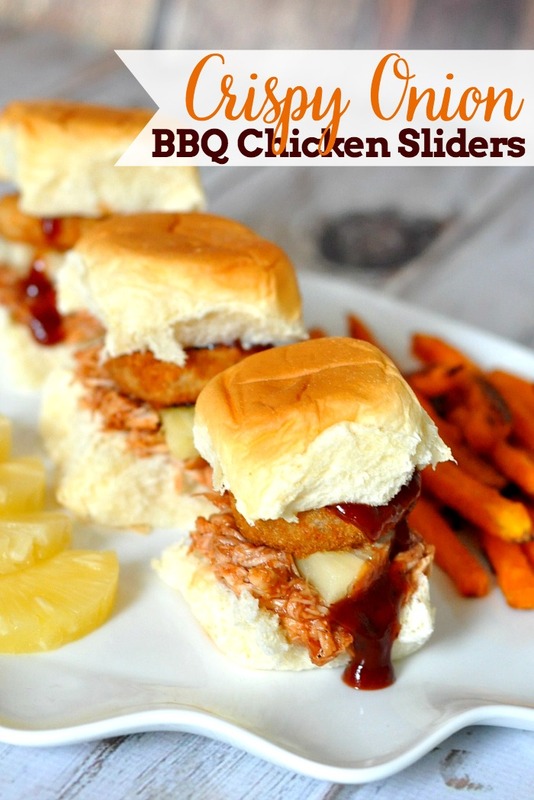 These Crispy Onion BBQ Chicken Sliders definitely fit the bill! First, the pulled chicken cooks in the crock pot without any fuss. It is tender and flavorful, so I make sure to set some aside pre-BBQ sauce to have for lunches or other dinner recipes using leftover chicken. Then, what says warm weather better than BBQ sauce? I hardly ever use BBQ sauce in the winter, so this tasted extra good in my books! To top it all off and give it a real fresh taste, I added a slice of pineapple and an Alexia Crispy Onion Ring. The Crispy Onion Ring make this slider! It offered the perfect amount of crunch and flavor, especially paired with the BBQ sauce and pineapple. Plus, they were so easy! Just throw them in the oven for about 17 minutes and they are ready to go. I’m always about the easy factor. You will definitely want to make a few extra to eat along side the sweet potato fries. I love their Sweet Potato Fries with Sea Salt, but their Spicy Sweet Potato Fries might be my favorite. I love food with a little kick! Place cleaned chicken into the crock pot and add chicken stock. Chicken stock should come to the top of the chicken. Sprinkle an even layer of Season Salt on top (or another seasoning of your choice). Cook chicken on chicken for 3- 4 hours on high and 5-6 hours on low. When ready, take out chicken and use forks to shred. Add BBQ sauce. If you will be eating right away, cook onion rings while shredding chicken. Follow instructions on the bag. Cut your rolls in half, add BBQ Chicken, then pineapple slice, then onion ring. 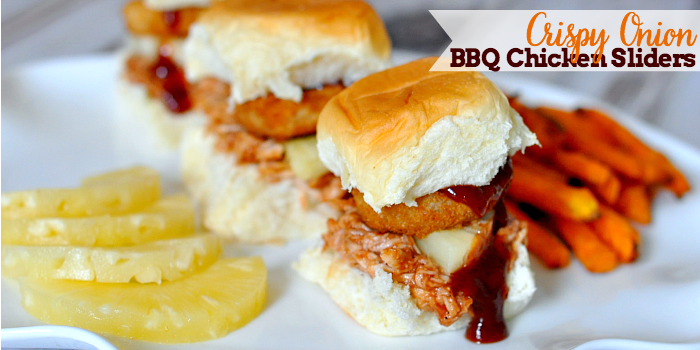 Add a little extra BBQ sauce for those that love more! Enjoy! 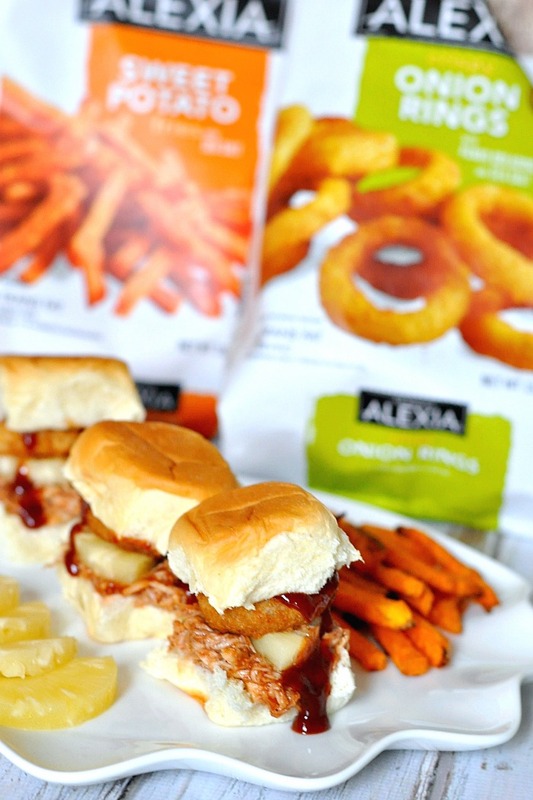 If you have never tried Alexia Food products, what are you waiting for? They are all natural, have amazing flavor, and are super easy to serve up! Consider making a fry bar at your next gathering. Who would say no to delicious fries covered in fabulous ingredients? You could even try making my Dessert Sweet Potato Fries! YOU MIGHT ALSO ENJOY MY OTHER SLOW COOKER RECIPES AND MY ROUND UP OF DINNER REIPES USING LEFTOVER CHICKEN! Wow! 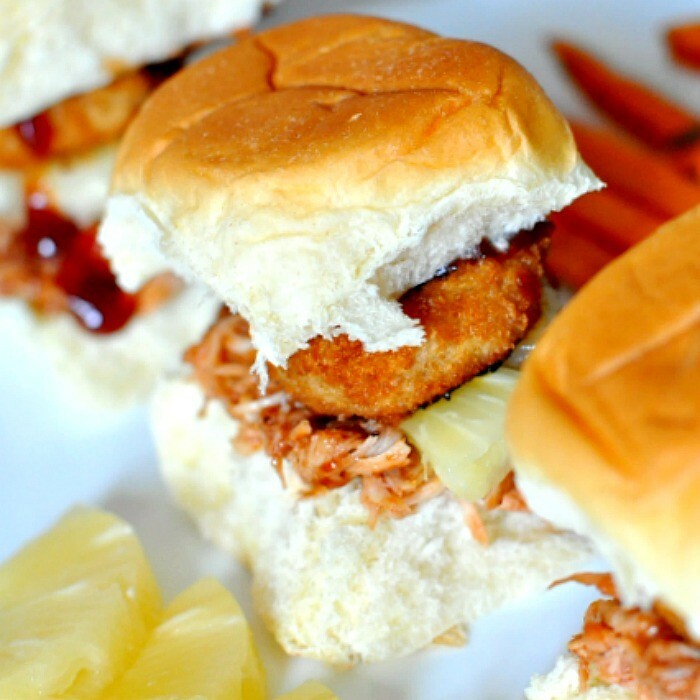 I’m a recipe addict on a health kick, so the sliders would be the perfect size for me! And the onion ring topper? Genius. Thanks for sharing!